(Newser) – A 1990s R&B singer died in a bizarre accident at her Los Angeles home Friday night. 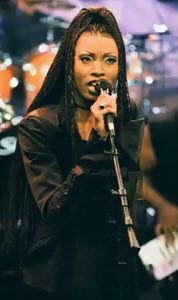 Charmayne Maxwell, a member of the Grammy-nominated group Brownstone, was reportedly home alone with her son after his soccer game; around 9pm, her husband, music producer Carsten Soulshock, came home to find her bleeding and unconscious. She had apparently fallen and sliced her neck on glass; LAPD sources tell TMZ it was a broken wine glass that cut her. She was rushed to a hospital but died en route; foul play is not suspected, but UPI reports that the investigation is ongoing. sorry for the lady, but got to ask; exactly how many jugs had she drank? and what was her son doing while all this was going on? his age isn't given of course, but if he's old enough to play soccer he's old enough to know to call 911. anyhow, my take. This has been seen before by ME's. Knives, too. Person holding knife. Person falls, retains grip on knife which pierces chest, neck, etc. I always suspect the husband and am usually right. Husbands, creators of the old: drowned in the dry bathtub, stories.